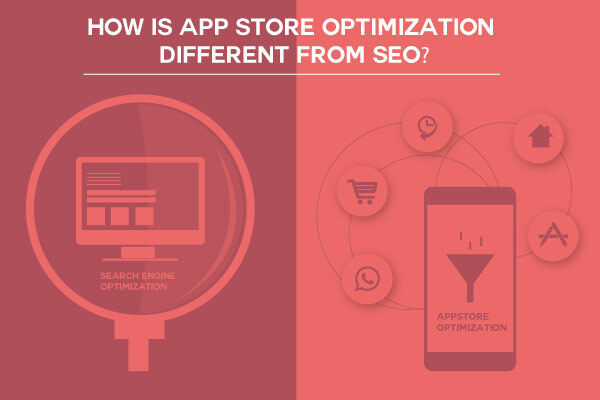 How is App Store Optimization Different from SEO? App store optimization, or ASO is in simple terms, a growing and effective method of building visibility of your app and conversion for your mobile app featured in app stores such as Google Play and Apple App Store. Optimization of your app is important as no app store offers any aid to improve the visibility of apps. You might know that many app developers think that there is no difference between app store optimization and SEO. Most business people know only about SEO and that’s why it happens. We are going to explore the major differences that may help you understand how app store optimization is entirely different from search engine optimization. If you find an app developing company works to list out popular keywords on web search, then they are on the wrong path. They have to optimize their app for searches specific to app stores, which would be entirely different from the popular searches in the web. Optimizing for web search will hardly give you any results. Do you think is it sensible to target web search keywords where search for app store is needed? Or just think how people search for apps. A recent study on mobile apps reveals “majority of app users find apps by searching in app stores”. The second possibility for finding an app is via friends, as they drive people to make searches. It’s obvious that mobile users are discovering and installing apps through the app stores. If you want to build an optimized app page, you should know the basic difference between app store’s search and web search. To be precise, the purpose of the user is the major difference. It’s clear that users expect one kind of results while searching the app stores and a set of different results during web search. Interestingly Apple and Google know this user psychology very well. For instance, if you search for a particular word in a web browser and in Apple’s App Store, results would be completely different for both. To understand the search behaviour of users in app stores, App Store Intelligence software may help you. Relevant coverage is important for changing your app’s targeted audience into installs and users. You have to optimize your app’s page with relevant phrases and keywords in order to get your apps discovered in app stores. Like that relevant coverage will give you results. It’s obvious that your app will drive more installs if you can increase conversion rates. If your app’s visibility is higher for a specific search, it shows that your app is relevant as per the app store ranking algorithms of both Google and Apple. It’s noted that Google considers conversion rates for their web search ranking algorithms. Like that if your app has an increase conversion rates among your clients’ portfolios result in higher rankings in Google Play. In this case, Google consider that app store search for the running app is not significant for searches connected to game on free runner. You can do app listing effectively only if you know what to choose for optimization. In order to get maximum downloads for your app; the only app store optimization tactic you can adopt is relevant coverage of app store search.